"The death of [Hafez] Assad appears to have driven the final nail of the coffin of peace efforts between Israel and Syria." So reads a typical assessment. But this analysis has it exactly wrong. So long as Syria's President Assad was alive, there was never a chance of a Syrian-Israeli peace treaty; now that he is dead, it is newly possible. 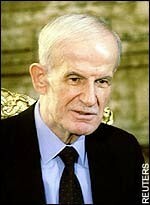 Hafez al-Assad in his later years. Although Assad entered into formal negotiations with Israel in 1991, he never seriously contemplated signing a treaty with the Jewish state. Doing so would have had, from his point of view, profoundly disturbing implications for Syrian public life. He feared that an agreement with Jerusalem would signal to the Syrian population that his regime had turned to the West and abandoned its rogue ways. They then would expect life to soften: an end to emergency law, no more jailings without charges, less censorship, less control of every institution from the Presidential Palace. In other words, Assad would be expected to give up the totalitarian tools on which he had long relied. Worse, a treaty with Israel would have raised expectations of freedom of movement and press, the exhilarating potential made possible by modern communications and fewer military obligations. It would have meant foreign investment, human rights groups, political parties and a parliament that did more than wield a rubber stamp. Assad, who for 30 years ran a regime premised on force, had no idea how to handle the subtleties of a democratizing system and wanted absolutely nothing to do with such innovations. That said, after the Soviet collapse in 1991, he needed to court the West. So he went along with the Westerners' demands for a peace process, playing at negotiations that he had no intention of ever letting succeed. For nearly nine years, he brilliantly went through the motions of engaging in a credible negotiating process with Israel. A quick review of that process, however, reveals a recurring pattern: Assad made an audacious new demand on Jerusalem, the Israelis initially resisted, then acceded to his demand. To which, instead of saying, "Fine, let's sign," Assad came back with yet another demand. And so it went; despite repeated concessions on the Israeli side, the two parties never came within striking distance of an agreement--that new demand from Assad always stymied things. Assad's cleverness at negotiating, combined with a fervent desire among the Israeli and American leaderships for an agreement, blinded many people to this pattern. Thus did Assad's plan work beautifully: He got credit for a willingness to resolve the conflict with Israel and never had to sign the dreaded peace treaty. But with Assad's death yesterday morning, the situation in Damascus changes completely. While it is far too early to tell who will have what future role there, it seems quite certain that whatever happens, the fears and logic that drove Hafez Assad are defunct. No one else there has the anything like the experience nor the outlook of the late dictator--certainly not his son Bashar; nor will anyone dominate the country as he did, at least not for a while. This has the happy implication that no one will fear an opening up of Syrian life as did the elder Assad. The great constraint on Syrian peacemaking is gone. Far from driving the "final nail" into the peace process coffin, his death pries the coffin open and allows the corpse for the first time to come to life. That said, things could also get worse. Just as Assad studiously avoided a peace treaty with Israel, he also made sure there was no all-out war. To be sure, his proxies in Lebanon battled Israeli forces, but he insisted on a total quiet across their mutual border of the Golan Heights, where things could really get hot and quickly lead to a major conflagration. Ironically, this made the Golan about the safest place in the Middle East. With Assad's 30-year reign now over, that could change; rivalries within the Syrian elite, for example, might lead to war. In other words, what was a deeply static and predictable situation has burst wide open. U.S. policymakers are coming off of nearly a decade's worth of frustration, caused by their having never understood the crafty game of an old-school totalitarian like Assad. The change in personnel now underway offers them great opportunities--precisely because the new leadership is more Western-oriented and thinks more like Americans do. If Assad senior was unmoved by the promise of peace with his Israeli neighbor, the return of the Golan Heights and substantial sums of money, these benefits are likely to weigh much more heavily in the decision-making of his successors. Thus is a Syrian-Israeli deal more likely now than at any time in the past. Syria: A Partner for Peace?